A short distance from Atlanta, Pensacola, Florida is a fantastic vacation...for a night, a long weekend, a week, or even longer! And it's great most any time of year. On my last visit, we toured the National Naval Aviation Museum, quite an exciting excursion for me, having served in the U.S. Navy. 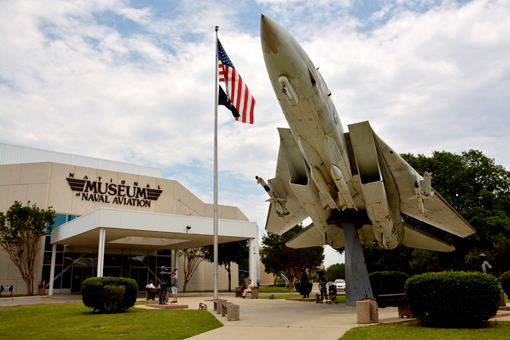 The Museum is a military and aerospace museum located on the grounds of Naval Air Station Pensacola. My best friend Barry came with me (Thanks for driving, Barry!). We were going to the wedding of another best friend, MaryJo. Barry and I added a couple of days to our trip so we could play tourist. 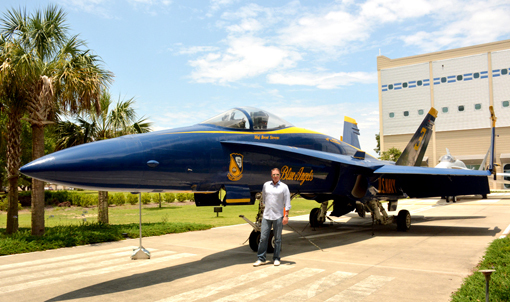 The top of my wish list was the National Naval Aviation Museum...and hopefully to see the Blue Angels. There was something going on that weekend and we did not get to see the Blue Angels, but there are a number of Blue Angels aircraft at the Museum, displayed outside AND they have their own exhibition inside the Museum. We also did the Blue Angels 4D Experience! 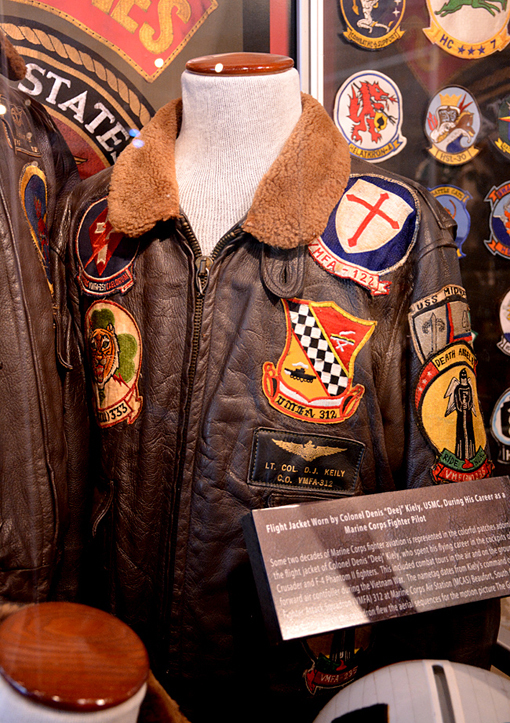 The mission of the National Naval Aviation Museum, an official Department of the Navy museum, is to "select, collect, preserve and display historic artifacts relating to the history of Naval Aviation". Believe me, that's exactly what they've done and are doing! 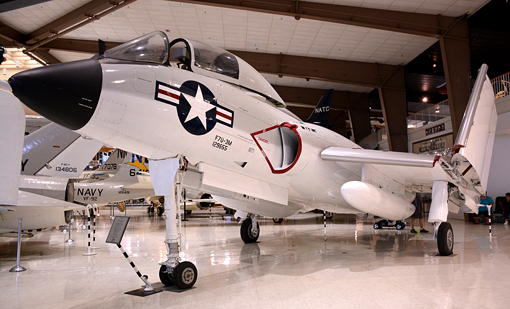 The National Naval Aviation Museum is world's largest Naval Aviation museum, which features more than 150 restored aircraft representing Navy, Marine Corps, and Coast Guard Aviation. Those aircraft are displayed in its more than 350,000 square feet of museum space, and some are displayed on part of its 37-acre complex. When I say "make time" for a great visit, that's why! There's a lot more at this museum than we could have possibly seen during the five hours we were there, but we gave it a great try and had great fun along the way! I have a model of Marine One that I picked up when I lived in DC and volunteered at the Smithsonian National Air & Space Museum. 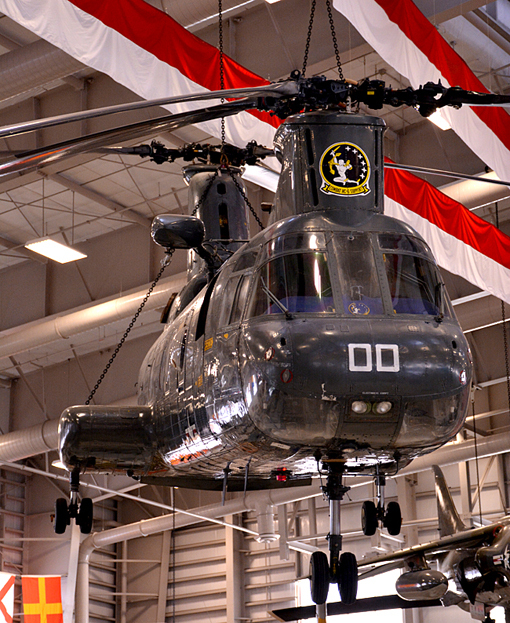 At the NationL Naval Aviation Museum in Pensacola, they have a VH-3 Marine One, that you can board! That is the coolest thing ever! That's Barry sanding inside Marine One offering a presidential wave. In case you didn't know, Marine One is the call sign of any United States Marine Corps aircraft carrying the President of the United States. That aircraft is typically a helicopter operated by Marine Helicopter Squadron One, also known as "Nighthawks". 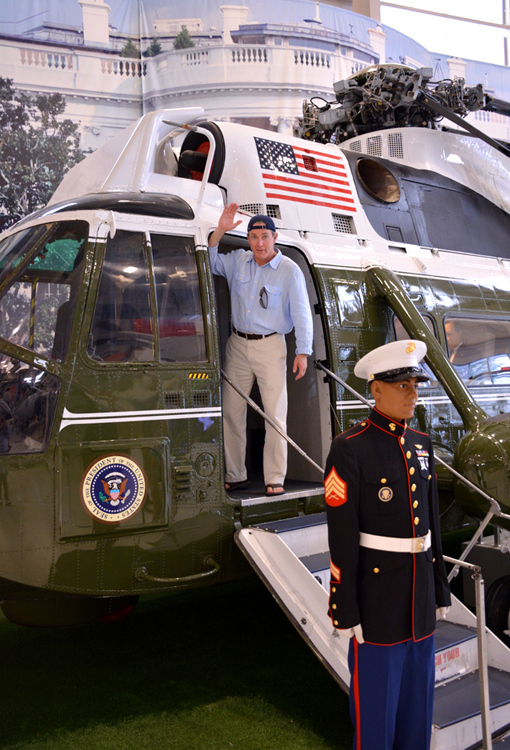 No matter where Marine One lands in the world, the President is always greeted by a Marine! While a great many of the more than 150 aircraft on display are relatively modern, the collection dates to the beginnings of Naval Aviation. There must be hundreds of thousands of artifacts on display and I can only imagine what's in their collection that's not on display! When I volunteered for the Smithsonian when I lived in DC, I learned that only about 2% of their holdings are on display at any given time—in their 19 museums! I can't imagine anyone not wanting to immediately want to visit the National Naval Aviation Museum as soon as they learn it exists, but if you need a preview for additional motivation, here's a virtual tour! 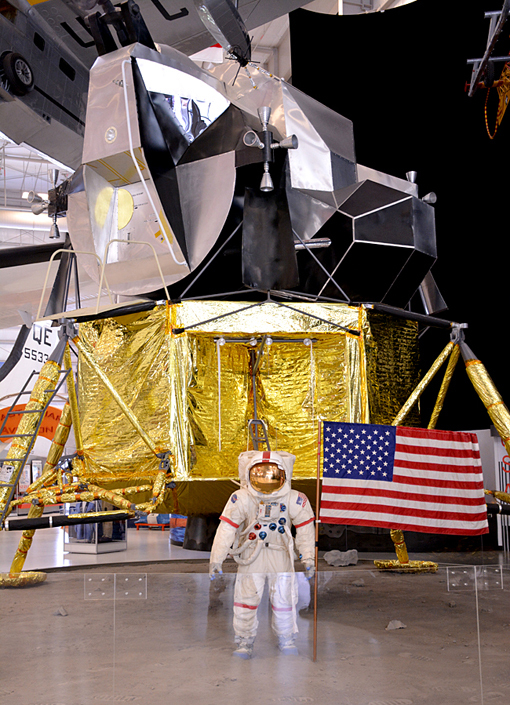 I had the awesome experience of volunteering at the Smithsonian National Air & Space Museum when I lived in DC, one of the most visited museums in the world—the National Naval Aviation Museum is one of the most visited in the state of Florida! Between those two museums, the Delta Flight Museum, a helicopter tour, flights with friend pilots (they let me take the "wheel"), a tour of the Rocky Mountains, and domestic and international travel, I've spent an amount of time in the sky, and that's not to mention when I went skydiving! I love the skies! Barry and I took a ride on one of the flight simulators—actually more than one—at the National Naval Aviation Museum. A word of advice folks...when they say take everything out of your pockets, just do it. It'll mitigate any unplanned landings. Yes, we had an incident, but the operator, after purging the pod of whatever it was that wanted to go clink, clank, clunk, allowed us to continue our flight. "Thank you!" When I was in 10th grade, I wanted nothing more than to become a helicopter pilot. Due to some family drama (and lack of tenacity), those dreams were dashed, but I never stopped loving helicopters. I would still love to one day learn how to fly them! It was many years later when I experienced my first helicopter ride...and was it ever so amazing! I was in Las Vegas, a city I and one of my grandmothers loved, on vacation and a friend who was there for a convention treated me to a helicopter tour of the Grand Canyon! We flew over downtown Vegas, over Hoover Dam, Lake Mead, the Grand Canyon and then we LANDED inside the Grand Canyon, had lunch with champagne, had time to explore and make photos and then returned on the same flight path. WOW! What an experience! Yes, I'm jealous of Navy helicopter pilots, but I also applaud their commitment and service to our country. While exciting, being a helicopter pilot can be dangerous when protecting our country and its allies. "Thank you for your service." I've been a space geek since I was...well, I remember watching outer space science fiction movies when I was six years old and loving them! Yes, I was born before humans landed on the moon, but I don't remember that first globally broadcast program—Neil Armstrong walking on the moon. But I did get to work for the company responsible for that global broadcast and met quite a few astronauts during my time there. One of the astronauts I had the great honor of meeting was Pierre Thuot, a graduate of the Naval Academy and an accomplished Navy pilot. He has piloted more than 40 aircraft! When I was working for Intelsat, the world's largest satellite communications company, one of my first projects was to organize the 10th anniversary celebration of the rescue of the Intelsat-603 satellite, on a Space Shuttle Endeavour mission—a spacecraft I later got to see up close and personal. Pierre, among many other dignitaries, was one of the guests of honor, as were Mission Commander Daniel Brandenstein (also former Navy) and Shuttle Pilot Kevin Chilton. It was one of the highlights of my life, professionally and personally. My usual souvenir when playing tourist is a book about the attraction or city I'm visiting. One of the books I got on this visit, in their awesome gift shop, was, "National Naval Aviation Museum: The Historic Collection", which includes a section dedicated to Naval Aviation's contributions to our space program. 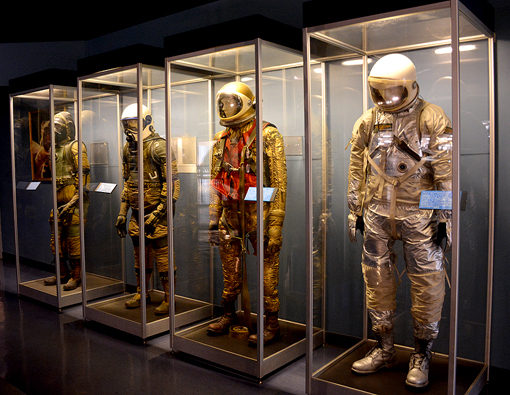 The above pictured suits are, left to right, the Model 3 (1953); Model 2-A (1954); Mark III (developed specifically for the U.S. Navy) and the XN-17 (1962), an adaption of the Mark IV, which was modified for America's first manned space missions. 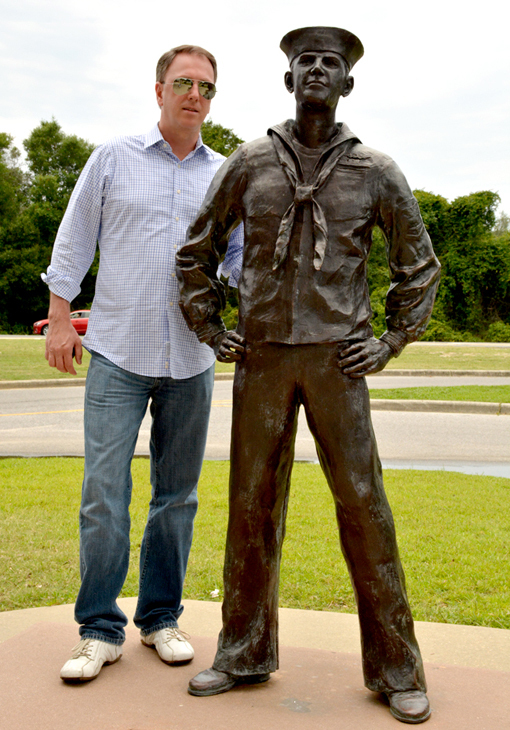 I'm still in touch with some of my Navy buddies and might get to see some of them later this year. The base where I was stationed in Nea Makri, Greece, has long since closed, but there's still an annual reunion. This year it'll be in Tampa, next to St. Petersburg where I was born, so that would be multi-purpose trip. I also have some dear friends there. You just might be seeing a post about those cities later this year! I mentioned that this is a military and aerospace museum. You will see men and women in uniform throughout your visit. Please thank them for your service, when you can. Also, you will have to go through the Naval Air Station's gates, so be ready to show government issued identification. Show respect when on the base AND have a great time! Just down the street from the National Naval Aviation Museum is the Pensacola Lighthouse, which we visited immediately after leaving the Museum. Be sure to check it out...and yes, you can climb to the top where you'll have a grand vista of the Museum and the beach! 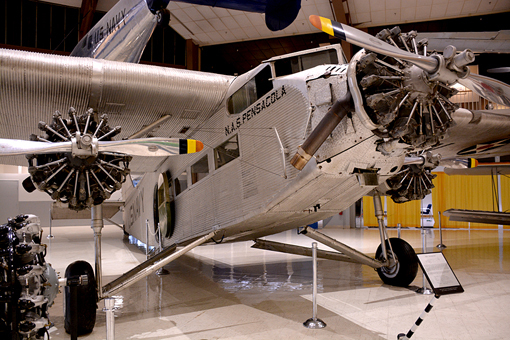 Remember, make plenty of time to explore the National Naval Aviation Museum. There are so many wonderful things to see here and you can lunch there so you can keep on exploring. Please find LOTS more photos of my visit on the wanderlust ATLANTA Facebook page!